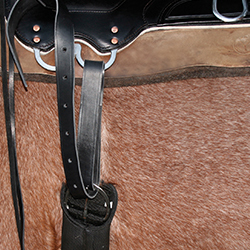 Tucker's Adjustable Position Rigging allows you to rig your saddle to best fit your horse. 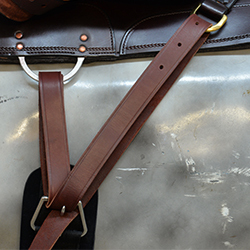 The full position, pictured at right, puts more force on the front of the saddle. 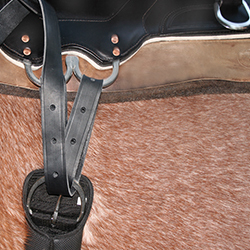 For this reason, a rear cinch is typically used to keep the saddle tight in the flank. This keeps the saddle from tipping forward and pinching the horse's shoulders. Since full rigging provides maximum stability and prevents movement, this is the standard for most arena ropers or trail riding on uneven terrain. 3/4 position is arguably the most secure single position rigging, offering a more even pressure on the front and rear of the saddle. Make sure your horse's barrel is suitable for this position, otherwise your girth could slip off center. The most popular position for trail riders today. 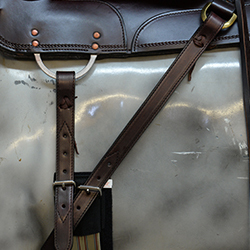 7/8 provides an even pressure and fits the majority of trail horse conformations. If you'll be riding on uneven terrain, you should consider adding a rear cinch. This position is achieved by utilizing both dee positions at the same time. 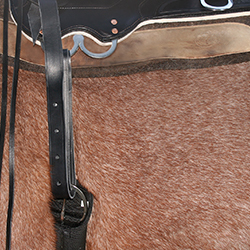 This style has a conventional front dee attachment with extra "front to back" straps on either side forming a Y on the saddle with the front dee in the middle. 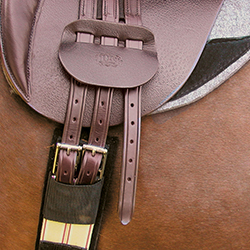 The front to back straps create an extra snug fit and make steep riding more secure. 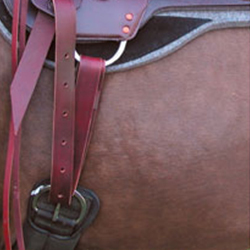 This style is conventional Western rigging with tie strap and off billets, but sits lower on the horse for less bulk under the rider's leg and closer contact with the horse.